Style Utilities is a growing collection of functions designed to aid in formatting text quickly and accurately. This utility changes the paragraph style if there is a specific character in the first user-definable number of words. Additionally, the first words can optionally have a character style applied. For example: any paragraph which has a period (full stop) in the first two words can have an alternate style applied. One very useful application, is in conjunction with Drop Words. Very often, if a paragraph starts with a paragraph number, the number of drop words must be set to two instead of one. Conditional Style Changer can identify these paragraphs and change the paragraph style so Drop Words can apply the drop to the correct number of words. This utility applies a character style to text between two user-defined delimiters. The length of the text can be limited by both minimum and maximum values. For example: all text surrounded by parenthesis which is less than 20 characters can have a subscript style applied. This utility changes paragraph styles based on the number of lines the paragraph takes up. This is especially useful for quickly applying styles to header paragraphs. Consecutive Styles is a utility which applies styles to consecutive paragraphs of specific styles. It can be used in a number of different situations. It can be used to change the style of any paragraph of a particular style followed by a paragraph followed by a specific other style. It can be used to change the style of a paragraph preceded by a specific style. It can also be used to change the styling of a number of identically styled paragraphs, by either changing the first one or the last one. 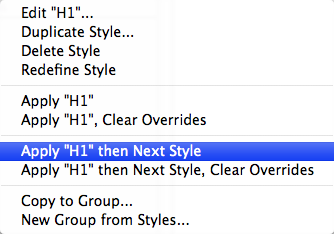 InDesign has the ability to define “next styles” to paragraph styles. “Next Styles” are paragraph styles which should be applied after the defined one. This is great when typing or pasting in text. You can set up a whole series of styles which can each be applied in turn. After selecting Apply [style] then Next Style, the entire “next style chain” will be applied to the selected text. A problem becomes apparent however, when you have a style scattered around your document which should have a series of styles following it, but it can not be looped in a structured loop (for example, if you have a series of headings and then a non-determined number of body text paragraphs). That’s why we created the “Apply Next Styles” function. It searches the document for every instance of the style you select and then applies all the “next styles” in turn. This utility will automatically create hyperlinks from any text it recognizes as a valid URL. It’s very smart, and will ignore manually inserted line breaks on long URLs as well. You can select the character style to apply as well as the scope of text to change (Document, Story, or Selection). 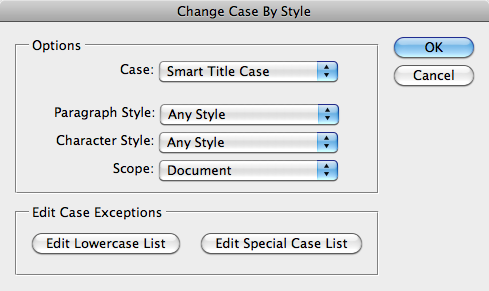 This utility will change all text with the specified style(s) to the selected case. There are four different options: UPPERCASE, lowercase, Smart Title Case, and Sentence case. Uppercase, lowercase, and sentence case are the same results you would get by changing the case manually. Smart Title Case, is (as the name suggests) very smart! It will automatically convert text to title case based on complex rules! The first and last words are always capitalized, as well as any word following a period (full stop) or colon. Any compound word separated by a “/”, “.”, dash or m-dash will have the letter immediately following the separator capitalized. Any other word will be capitalized unless it appears in the lowercase word list. Any word appearing in the file will be lowercase only if it is not a “starting” word. For example: In the title, “The Last of the Mohicans”, the first word “the” will be capitalized, while the second time “the” appears will not. This is because the first word is the beginning of the sentence. Similarly, in the title, “Lion: The King of the Jungle”, the first word “the” will be capitalized because it follows a colon. The lowercase word list can be edited to include any words you like. All words should be separated by a single space. Any word appearing in the special case list will always be capitalized exactly as it appears in the file, regardless of position. This is useful for words like “InDesign”, “USA”, “UK”, etc., which have capitals in the middle of the word. This file can also be used to force lowercase on specific words and override the default rules. So, let’s assume you would like the word “a” to always be lowercase, even if it is the first word in your header text. You would simply put the word “a” in your special case list, and it will always be lowercase. When a word appears in both lists, the special case file supersedes the lowercase one. 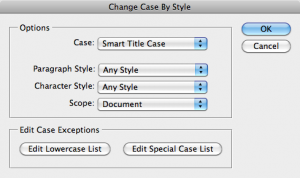 The Smart Title Case of Formatting Tools uses the same logic as the Smart Title Case of Power Headers, and the same word lists are used for both plug-ins. Word lists should only be edited using the provided dialogs. You can select a paragraph style, a character style, or both for options of which text to convert. You can also select what scope of text to convert (Document, Story, or Selection). If neither a character style or paragraph style is selected, all the text in the selected scope will be converted. We hope to add more utilities in the future. If there is a formatting utility that you would like to see added to this collection, please contact us at wishlist@in-tools.com. Registered users are eligible for free upgrades as new functions are added.